Live at Sonar Festival, MACBA. 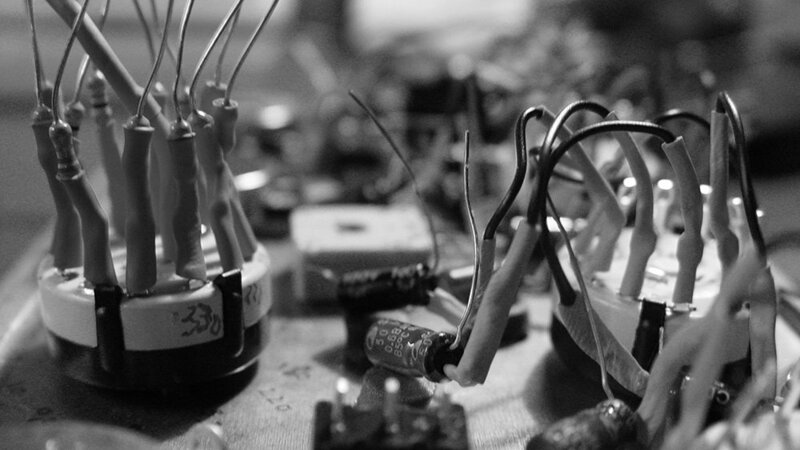 Juan Matos Capote: Home-made and modified electronic appliances (oscillators, radios, etc. ), field recordings and video. Matos Capote applies circuit bending and more orthodox techniques to build oscillators and to modify radios and other electronic devices, which he often connects, when playing, in different configurations to create new systems of expression. Most of his systems are characterized by random, yet controllable, behaviors. He bases his sound vocabulary on fragmentary and dry textural qualities, using an abundance of high frequencies to construct his pieces. His works have been described as having both a somewhat raw and direct quality and a subtle structure. When improvising, he focuses on what he calls a vertical perspective rather than on a horizontal, or linear, narrative. This strategy allows him to conceptualize sound in spatial terms more than in temporal ones and, when put into practice, enables him to decelerate the fast and fleeting sound output of his home-made electronic devices. Failure and success are at the heart of his introspection. Live at STEIM, Amsterdam, 2011.